"What will our world be like in 2050? 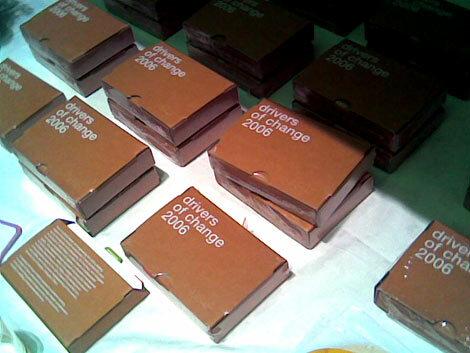 This set of cards identifies some of the leading drivers of change that affect our future. Each card depicts a single driver. A factoid and rhetorical question are on one face, backed up by a brief indication of the breadth and depth of the content on the other face. The set was devised by the Foresight & Innovation team at Arup, a group tasked with exploring emerging trends and how they impact upon business of Arup and its clients. The publication serves not only as a vibrant visual record of research, but also as a tool for discussion groups, personal prompts, for workshop events or as a 'thought for the week'." I thoroughly commend this kind of highly enlightened 'open-sourcing' of research (I mentioned similar strategies, under the sub-heading 'Transparency and nurturing design', in a report for the DTI.) It's a more pragmatic version of their colleague OMA/AMO's output, perhaps. "The fabric of the building itself appears, like the contents, to be in a state of artful decay suggestive of a business that is transient and about the crafting of great objects. 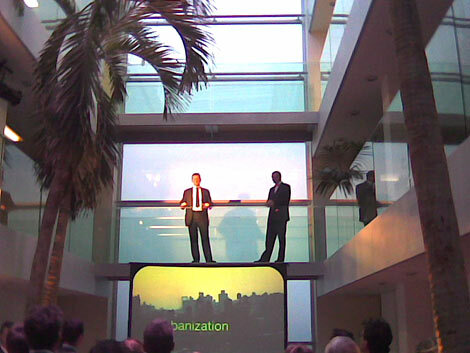 Such a stage set was part of the client's brief. It recognised the concept of constant maintenance as something that would make the experience real. This creates the illusion of a working building within which it is almost possible to feel the iron dust under one's feet; smell the Player's Cut on the breath of the invisible midshipman; and sway with the ship in the crow's nest." The ship is positioned within a dry dock, which features a false glass ceiling at the waterline, sealing the ship to the sides of the dock. This glass roof is then flooded with water from above, enabling the exterior of the ship to be seen 'floating' whilst creating a new exhibition space underneath the glass and around the hull. This 'underwater' environment can also be controlled to prevent any further corrosion. As the article notes, this underwater environment presents "a glorious Jules Verne adventure". 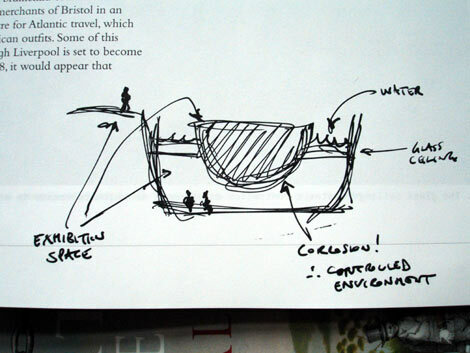 (The architects are Alec French Partnership, with Arup.) It's a lovely concept, which looks to have been neatly implemented amidst the deliberate chaos of the shipyard. Notice: If you care about that kind of thing, many of the following links will feature spoilers, particularly for those watching at the pace that Channel 4 dripfeed the UK releases of 'Lost'. A while ago, I wrote about a theory of using the ripples made possible by new media, to enable a trackable 'social life of a broadcast', based on our work at BBC radio. What Lost has done is far beyond that, truly raising the bar for much mainstream media. Again, it's ever clearer - frankly it was at the time - that all those late-90s Flash experiences, grown out of early-90s CD-ROM experiments, were largely facile attempts at 'new media experiences'. Lost is a far more ambitious piece of media, which uses the entire web as its canvas and its entire audience as its creators. I'd suggest this piece of work - Lost, when viewed in its entirety - is truly new. In both senses. Anyway, Modernism special in The Guardian today, linked to the new V&A exhibition, 'Modernism: Designing a new world, 1914-1939'. The articles lose images of Penguin Donkeys, Aalto chairs and a couple from Corb in the translation from newspaper to web, but there's me lapsing into longing already. There are some great articles though. "Each person constructs his/her image of the city. This image is made out of facts, memories, experiences, stories, news - mostly invisible data, and not only of architecture, buildings and streets ... "SEARCHSCAPES: MANHATTAN" is an attempt to create a tridimensional map of Manhattan, using existing data from the web. 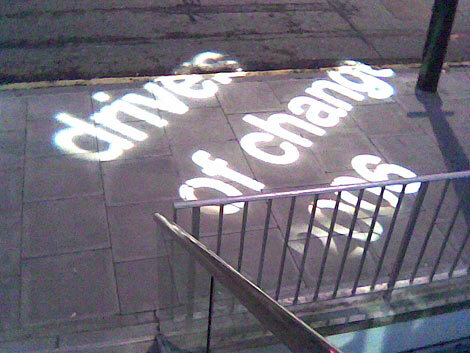 The objective is to compare the city's "physical spaces" and "information spaces ... Taking the metaphor very literally, a specific address is searched on Google (ex: "1 Broadway" + "New York, NY"). SUch a search will bring mostly results that correspond to this specific location. The total number of text results is parsed and then plotted on a map of the physical space. 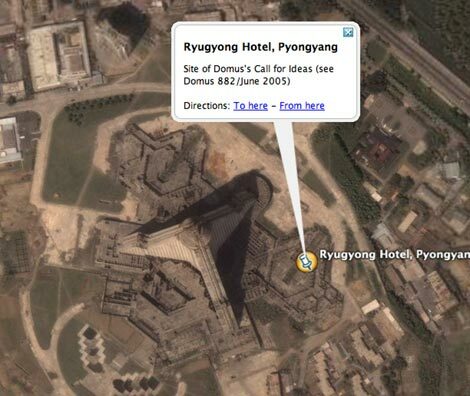 The height of the “building” on that location will correspond to the number of results found. More results will correspond to higher “information buildings”. This is an attempt to materialize information: to give it dimension, physicality. This project is an attempt to give "shape" to the data that we find on the Internet, but not “quantify"." Journal: "Architectural lines tracing from paper the nervelines of our best intentions"
"In the middle of a hot Australian summer, a new cross-city tunnel forcing motorists to use its subterranean tendrils, road closures making drivers either succumb to its expensive ease or find new ways about, tempers at breaking point, one suddenly caught a glance of the Sydney Opera House, out of the corner of the eye. There, centring the whole city of Sydney, this amazing building still had the power to overwhelm with its leaping shells, its suggestion of ascent to an empyrean. Fruit rinds, sails, wings—each person chooses their own imagery. How far removed from the sweat and fury on the roads below, what Platonic perfection in contrast to the swearing and rising blood pressure of infuriated drivers ..."
"Before you, above you, around you, is the winged victory of human aspiration made visible in concrete, steel and tile. 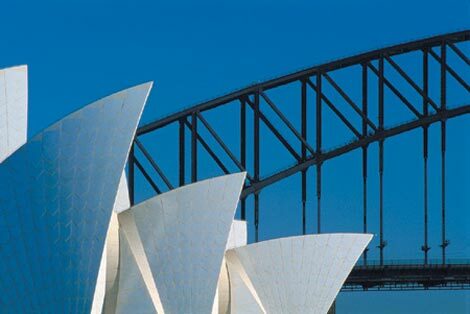 The Sydney Opera House stands, not phantasmagoric, something inspiration, technology and sheer hard work brought forth at the cusp of city and ocean, yacht sails and ferry lights disappeared in evening. A glimpse of the Sydney Opera House from a mess of traffic. The spirit is refreshed and your blood pressure eases, architectural lines tracing from paper the nervelines of our best intentions, metamorphosing into reality, not dissolving into thin air ..."
It's like a bumper Rodcorp 'How We Work' session. I can't shift these images from my mind. Two particular sets of recently-linked-to photographs which, although very different, seem connected in some way. They are both bystanders to an entwining of natural processes and human engineering. And both sets of images are sublime, but in the original fearful, awe-inspiring sense of the word. Smart piece of work by Italian architecture magazine Domus. 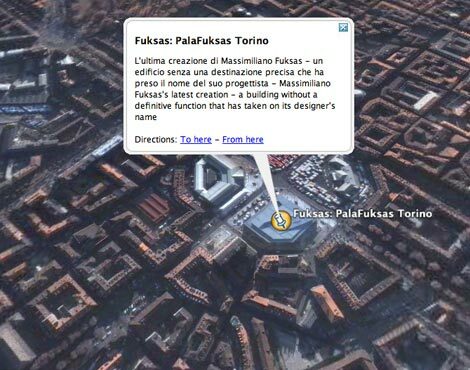 To accompany their latest issue, they've released a set of Google Earth links - 'Hyper Domus' - which enable you to zoom in to the setting of their articles on Toyo Ito's Mikimoto Ginza 2 in Tokyo, the Aurland Lookout in Norway, Fuksas' PalaFuksas in Torino, and their Ryugyong Hotel competition in Pyongyang. 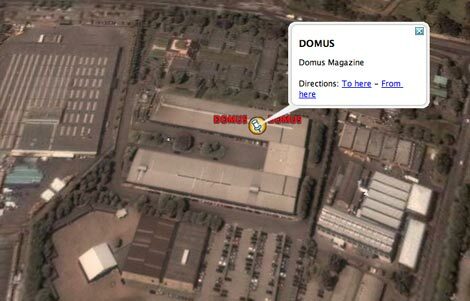 You also get to see that fabulously stylish Domus magazine appears to emerge from a large shed in a Milano suburb. "From the March 2006 issue (Domus 890), readers will be able to take a "virtual guided tour" of the buildings published in Domus thanks to a preconfigured itinerary that can be loaded in Google Earth. This itinerary will take you on a tour of the most recent architectural projects, viewed in context." At this point, given that the viewable context is somewhat limited, it's little more than a hugely enjoyable gimmick. There is surely long term potential here though, as the applications develop. Download the .kml file at the Domus site. In other mapping news, see also this handy Google-mapped set of 'Seinfeld' locations. As the 'Geography of Seinfeld' site says, "Some address are from the scripts, they may not make perfect sense in a real life." Not that there's anything wrong with that.